Good companions under a Strontium blue sky. 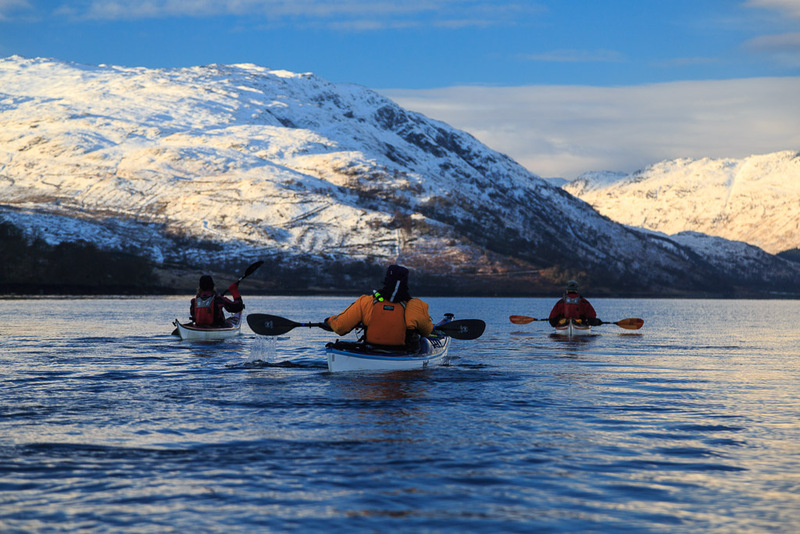 On the third day of our winter adventure we had originally planned to drive to the head of Loch Etive. However, when we had passed the minor road end on the drive north through Glen Coe it was completely blocked by snow. The day's forecast also promised heavy snow by the afternoon. Staff in the hotel told us that the road over to the head of Loch Sunart was clear so we decided to go there! 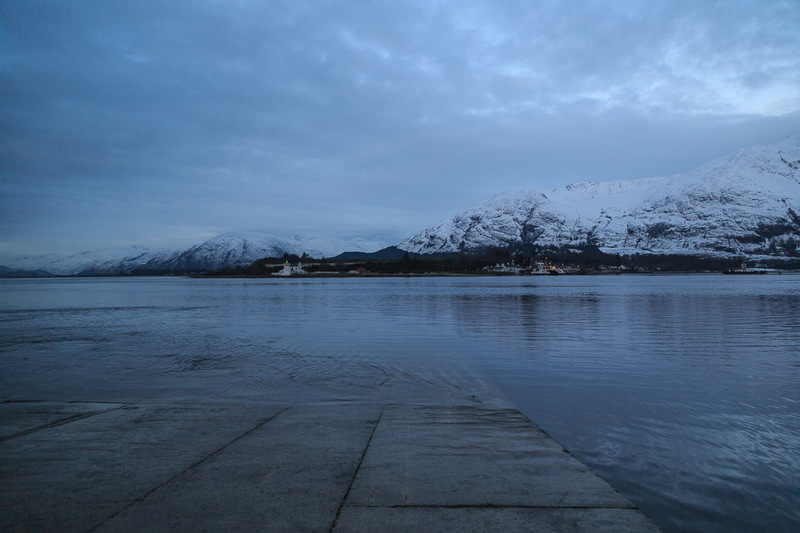 From Ballachuilish the quickest way involves a ferry across the Corran Narrows. The ebb had already turned and was streaming past the end of the jetty. It can get very rough here with wind against tide! 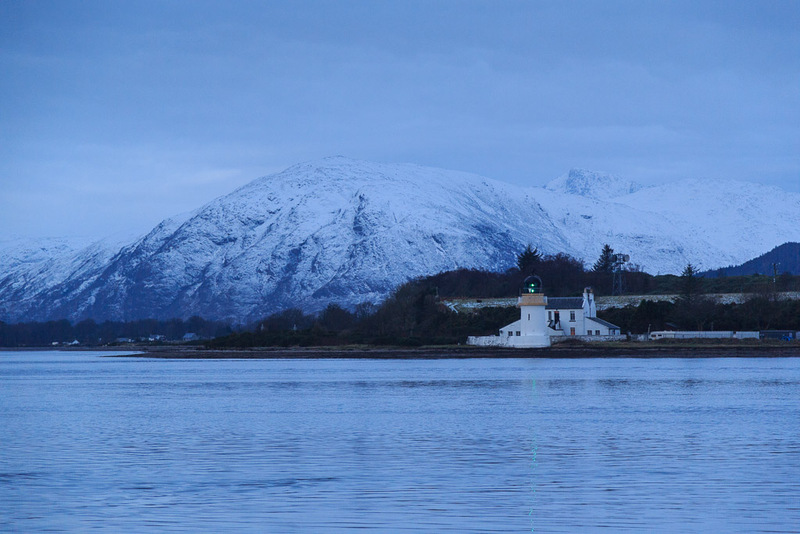 The Corran Lighthouse was built in 1860 by Thomas and David Stevenson.It was automated in 1898. 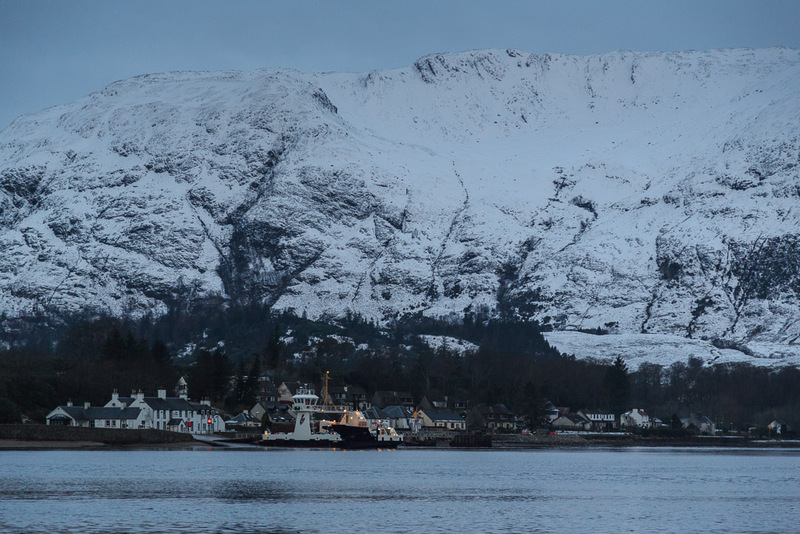 We had a short wait as the ferry was still at the Ardgour side. 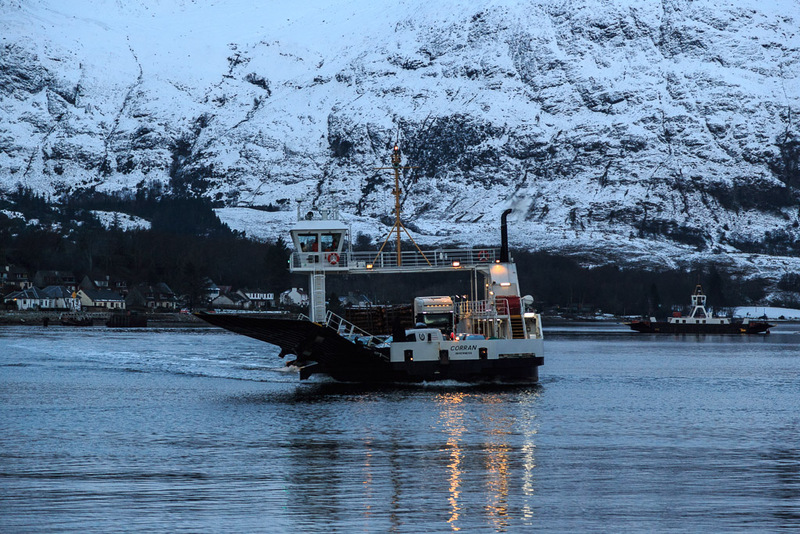 The main ferry is the MV Corran. She was built in Hull and entered service in 2001. The relief ferry lying at mooring is the MV Maid of Glencoul. She was built in Ardrossan and entered service on the Kylesku route in 1976. 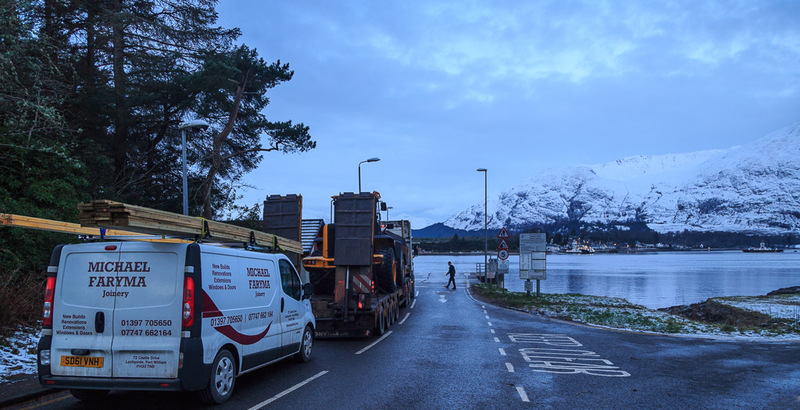 She remained there until the Kylesku bridge was built in 1984 when she was transferred here to the Corran route..
We drove to the Strontian slipway at the head of Loch Sunart. The element strontium was discovered here. The day already looked better than forecast. This is the view east up Glen Tarbert to the distant Glen Coe hills from which we had just driven. 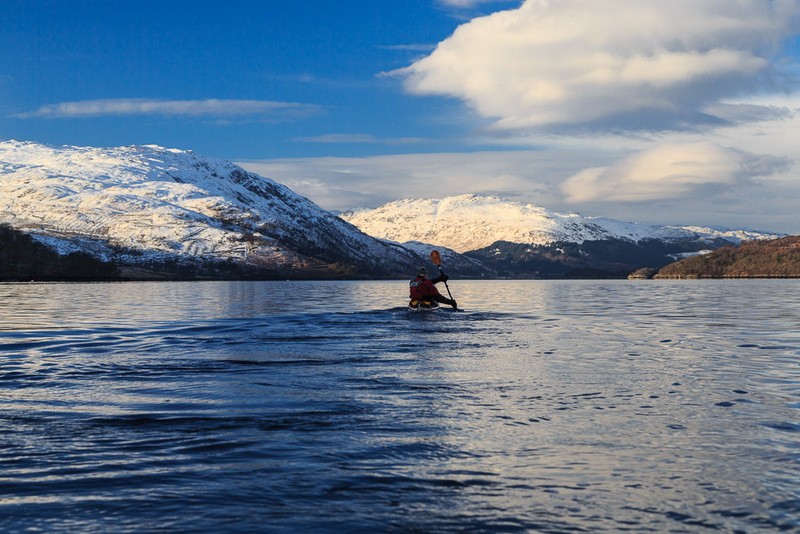 The summit of the glen is 117m above sea level but at the end of the last Ice Age when sea levels where higher, Loch Sunart connected to Loch Linnhe through Glen Tarbert making what is now the Morvern peninsula an island, in fact one of the Hebrides! 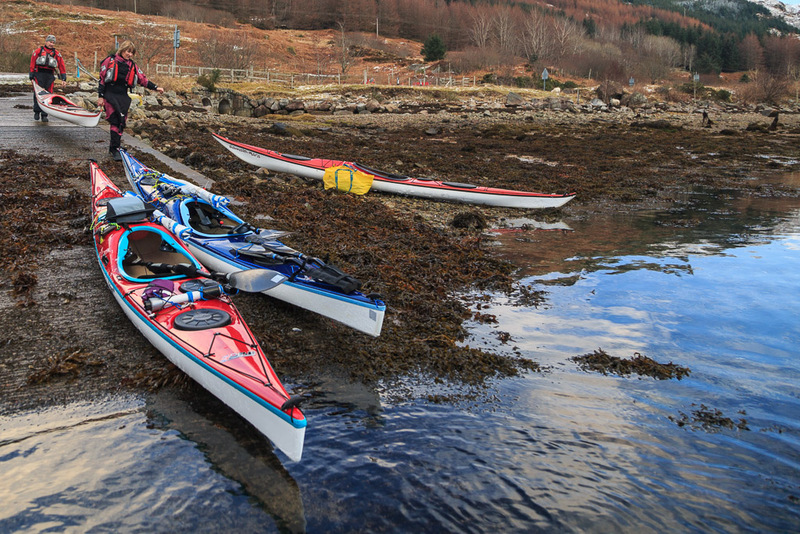 In 2010 we paddled round Morvern, shuttling across Glen Tarbert with the cars. 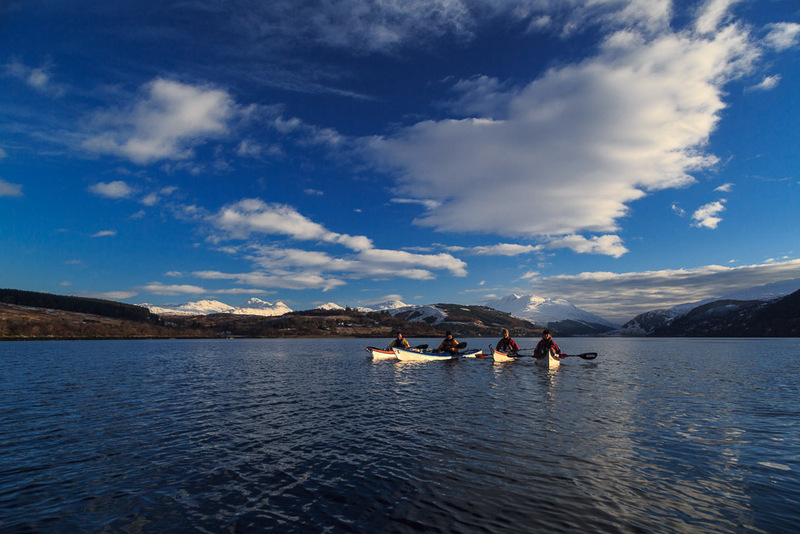 We had taken the chance and texted local paddlers Simon and Liz the previous evening. Ian and I were delighted when they agreed to come. 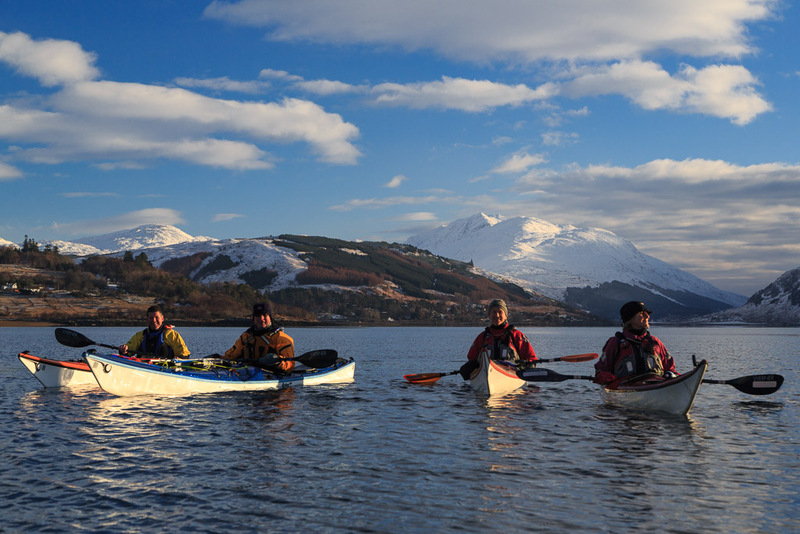 We had not all paddled together since the filming of Sea Kayak with Gordon Brown Volume 2 in 2011. ...the clouds cleared leaving a Strontium blue sky! 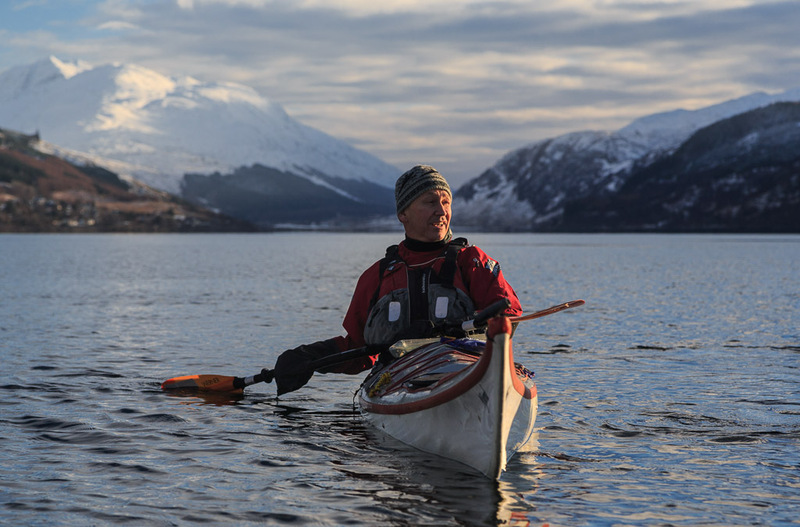 ...covered mountains and we would need to paddle 46 km before we reached the open sea! 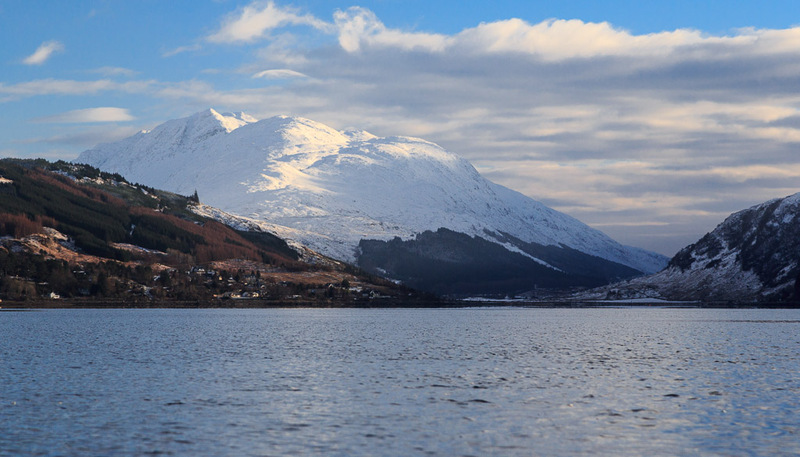 The view was equally good looking back up the loch. 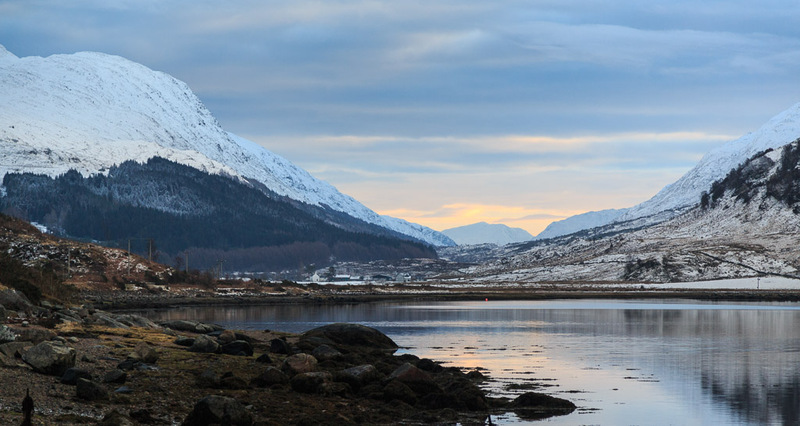 The bold slopes and ridges of Garbh Bheinn 885m rose high above the head of the loch. Looking at its snowy slopes reminded me of my late friend Dr John Tolmie who died in a climbing accident at the end of March 2014. John and I had been climbing the direct start to the Great Ridge of Garbh Bheinn on 11th August 1999 when all went dark, there was a near total eclipse of the sun! 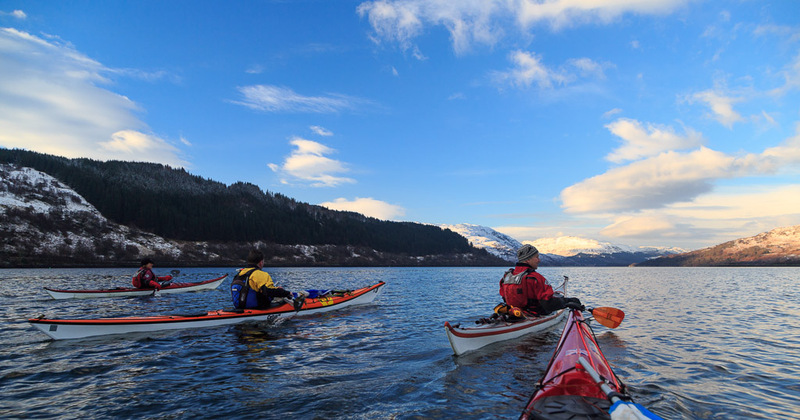 Although about half my paddling is on my own, I much prefer sharing my time outdoors with like minded folk. I had a great chat with Simon as he has recently also bought a Canon 5D mk3. I did notice he did not produce it on the water though! Mind you his is not off to Canon UK for repairs! I hope I get it back soon!